Avocado is considered to be a moist fruit rich in Vitamin A, D, E, proteins and avocado oil. It's super easy to be absorbed, helps recover softness and elasticity in your skin, and reduce fine lines. 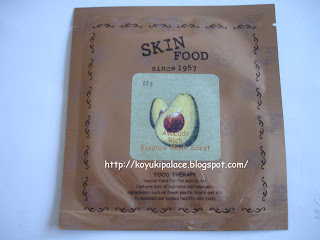 The sheet mask itself it made with superior cotton, high level of penetration into your skin. The essence also contains Hyaluronic Acid which locks moisture into your skin. Same as the toner and emulsion, it smells like berry (very fruity). After using the mask sheet, there's a thin layer of oil left behind, I guess that's avocado oil, leaving my face moisturized.